Pairin settles down in his seat as the train departs from the Tanjung Aru station. KOTA KINABALU: More reservoirs, rain harvesting and tidal gates at river mouths are among the proposals the state government is looking at as it tries to resolve the flooding problem in several districts in Sabah. “Of course all this will cost a lot of money but then what does not cost money? if we don’t plan ahead then we are not looking at the problem squarely in the face. We have to accept the fact that we will need funding to tackle this type of problem,” Deputy Chief Minister Tan Sri Jospeh Pairin Kitingan said. Pairin who was met in Papar yesterday, said this when asked to comment on calls by Sabah leaders for the government to expedite flood mitigation measures in low-laying areas such as Beaufort and Tenom which are experiencing the worst flooding in more than 30 years. The Infrastructure Development Minister assured Sabahans that the state government is looking for ways to resolve the flooding and it hopes to be able to implement some of the ideas that it has, soon. “As far as the Pegalan and Padas rivers are concerned, there is the upcoming Ulu Padas and Upper Padas hydro-electric scheme which the federal government has given the greenlight and some funding. “We need to look at this project in a more urgent manner so that it can be quickly put in place in order to have the benefit of controlling the flood. Once completed, it will certainly help the flood situation in Tenom, right down to Beaufort,” Pairin said. Another proposal was to install tidal gates at river mouths to stem the sea water from flowing into rivers during high tide, he said and explained that when it was high tide, the sea would create a sort of blockage at river mouths thus preventing the river from discharging its water. This situation is made worse during the rainy season when the river is swollen and the water has nowhere to go except over the banks, he said. “This happened many years ago in the state capital and because of that we constructed a gate and a pump at the Likas river mouth. When it is high tide and there is access water in the river, the water is pumped out to quicken the outflow. “All this needs to be taken into account including installing the same thing at the Petagas river mouth. Rain harvesting is also an option. Therefore projects of new buildings or housing should have a rain harvesting system put in. Also there is the need for the creation of more reservoirs,” he said. 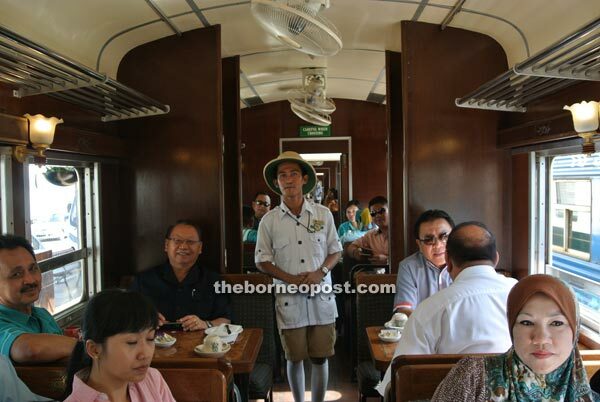 Pairin had taken the North Borneo Railway train ride from the Tanjung Aru train station to Papar station yesterday. He also disclosed that the train service to Beaufort and Tenom had been stopped as according to reports from the State Railway Department, there were several places where landslides and erosion had occurred, thus making the journey unsafe. The department is compiling the details but initial reports showed that the landslides and erosion which are caused by the flood have occurred in more than 10 spots, along the line. “This has to be given attention as the train service has been hampered. So people need to be patient as the flood and uncertain weather have caused a lot of damage either on the railway tracks or roads. “We need to look even closer now to what had been affected by the weather so that we can take into consideration the weak areas to ensure that these areas will be strengthened,” he said. On the railway upgrading exercise, Pairin said the project was ongoing and the state government was still waiting for some decisions from its federal counterpart as now there was a need to incorporate some of the occurrences which had recently taken place. Pairin when commenting on the train ride, said the railway service was one that could cater to the public, travelers and tourists. “Taking into account the usefulness of the rail service, I am giving it more serious attention and hopefully with everyone working and with the assistance from the state and federal governments, we will be able to pursue our objectives as well as look ahead in the context of extending the rail service to a wider area in order to boost the economic and social sectors of society,” he said. Accompanying Pairin were Assistant Ministers of Infrastructure Development Datuk Ghulam Haidar Khan Bahadar and Datuk Bobbey Suan and the ministry’s permanent secretary, Datuk Felix Madan.